The Borzoi or ‘Russian Wolfhound’ is a large and distinctive dog that, whilst being fairly rare in the UK, is a breed of true antiquity. Despite many confusing its narrow, deep-chested frame with that of the Greyhound, the Afghan hound and the Saluki, the Borzoi is characterised by a long, downy coat that sets it apart from other breeds and coursing hounds. The history of the Borzoi is truly exciting, if not largely unknown, and is believed to extend as far back as the 9th century when sight hounds were originally brought to Russia. Exactly when and how the Borzoi came about is uncertain but it is possible that Mongol invaders were in part responsible for its introduction, if not for the Borzoi itself, for some of the world’s earliest sight hounds. The Borzoi isn’t officially documented until 1650 when coursing hounds started becoming popular under the Tsar. In order to hunt game and wolves, Russian nobles needed a swift, streamlined dog with keen senses and abundant stamina. The Borzoi was a popular choice again and again because it fulfilled these requirements, plus it killed without tearing the game, leaving it largely preserved for the hunter. The Borzoi was highly esteemed in this role and became a symbol of the aristocracy – the only faction that were entitled to own and trade in the breed. Borzoi were often gifted to royalty or exchanged for property and, if a royal figure desired a bride, her father could be persuaded to part with his daughter on the promise of a Borzoi. Otherwise, unless you had the money or the status, coming into contact with these dogs was tightly controlled. Rumour has it that if a Russian noble caught you trying to touch or stroke his Borzoi, you would be put to death! The breed’s purity was strictly upheld and only the very best dogs were kept and bred from. Today's breed standard has remained fairly similar to the original, with a regal and athletic stature being prized, long, powerful legs, small, high set ears and a fine, narrow and slightly domed head. Borzois were and continue to be accepted in virtually any colour, with a long, wavy topcoat and a soft, insulating undercoat that sheds in summer. Prized Borzois were provided with their own servants, which fed and cared for them better than much of the Russian population was fed and cared for at that time. Large estates kept Borzois by the hundreds, organising regular hunts that served to feed the estates and their privileged inhabitants while the rest of Russia starved. It wasn't until the 1800's that Borzois started being seen outside of Russia, although their presence was still largely restricted to the royal and the noble. The Tsar gifted two Borzois to Queen Victoria who developed a keen affinity for the breed. Not only was the Borzoi a skilled working dog, but its sweet-nature and gentle spirit rendered it a wonderful companion animal. King Edward also shared the Queen's passion and took over the breeding of her dogs, helping to distribute them amongst the British nobility. Later monarchs went on to show the Borzoi - the Duchess of Manchester did so in 1863 and Queen Alexandra owned one of the earliest English champion Borzois - and as a result the breed's popularity soared. In 1891, the Tsar sent 20 of his finest Borzoi to Crufts (the very year it was founded) and sold them off at the end of the show. Their exorbitant price tags guaranteed that only the wealthy could take them home, something which upheld their status and kept their values high. - Tasha, a female Borzoi belonging to Buster Lloyd-Jones - the vet who founded 'Denes Natural Pet Foods,' is believed to be the ancestor of most pedigree bloodlines today. Tasha was born during the Second World War and was believed to be the finest example of a Borzoi anywhere. - You may well have seen the famous photograph of Edward Smith, captain of the Titanic, standing with his prized pet Borzoi, Ben. Ben was a white male Borzoi who, despite being picture alongside his master right before Titanic's maiden voyage, did not travel on the ship. - The oldest Borzoi on record was believed to be 14 years old. Thank you for the wonderful borzoi history! I love the breed for their athletic beauty and for their peaceful, relaxing personalities when at rest. I heard of one which reached the exceptional age of 19, and I had one myself which reached 13. I've had 2, my first borzoi named 'Russia' was my best friend when I was a child, loyal, protective fun and beautiful! A truly wonderful breed of dog, if I had the time I would certainly be looking for another one! 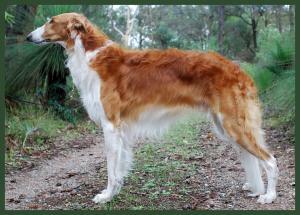 I had Borzoi over 20 years ago and also bred a successful show litter. I used to show and twice competed at Crufts with them. They are magnificent dogs who are quiet and gentle house dogs, yet so enjoy a good run over open ground. If I had the time to devote to another Borzoi then I would have another. They are definitely my favourite breed. Good that more people will know a bit more about this breed,have owned them on and off since 1978. Their only drawback is they are not particulary long lived and like most deep bodied dogs can suffer from bloat and of course torshion whis is life threatening if not dealt with immediately.